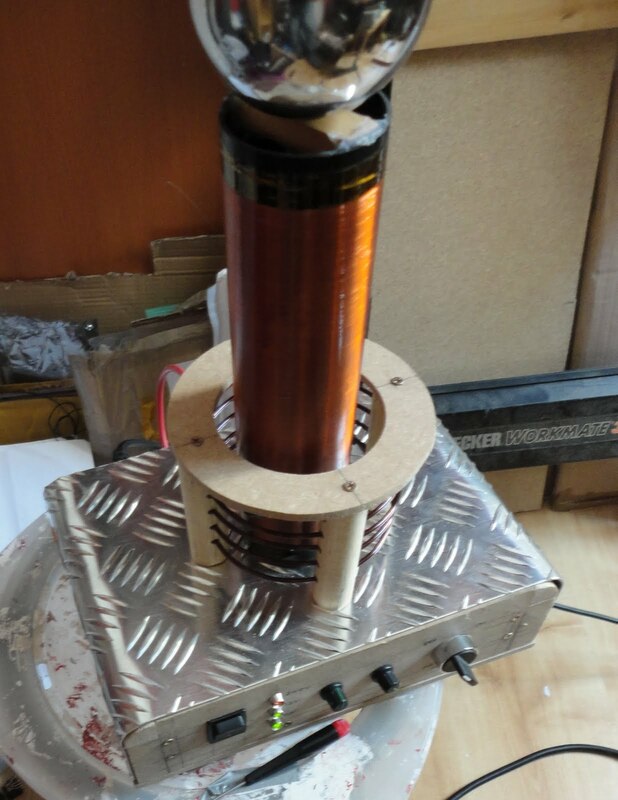 A solid state tesla coil is one that uses transistors to switch the primary coil voltage (instead of a spark gap or mechanical contacts). Using transistors also makes it straightforward to get the coil to spark at specific frequencies (e.g. to play a specific musical note). You can also make a simple feedback loop driven by an antenna picking up the EM field, which can automatically "tune" the coil to run it at its resonant frequency. I always meant to resurrect it in a more appropriate metal case and decided to go for some cool 1.5mm aluminium treadplate (not realising how hard it is to bend that stuff with any accuracy). My recently acquired jigsaw and drill press meant I was able to put together a box made of MDF sheets and pine mouldings which actually looks mostly OK :) The secondary is magnet wire (about 800 turns) wound on a PVC drain pipe, topped with a steel sphere garden ornament. Steve Wards circuit is designed to run at 120VAC US mains. 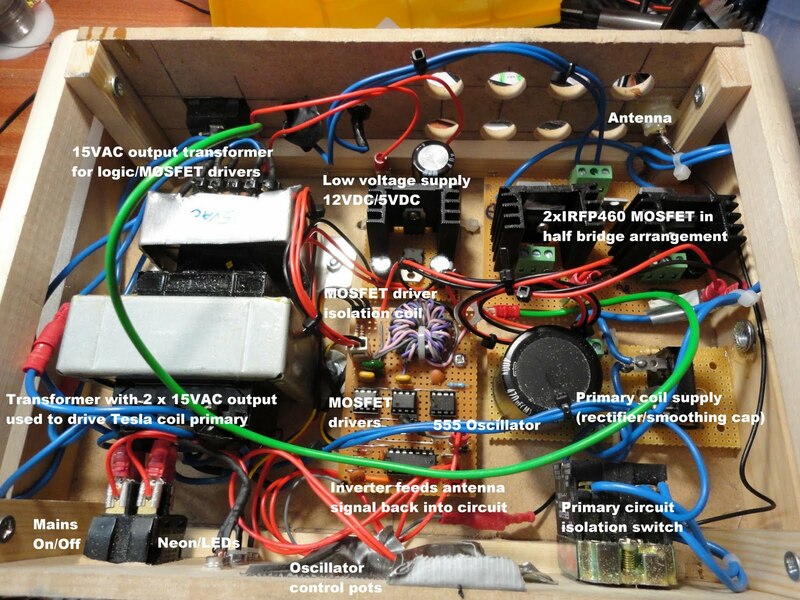 I built mine using uprated MOSFETs, caps and bridge to run at 240VAC UK mains supply, but I'm still being a chicken and running the primary through a step down transformer at 30VAC. Once I've played with different drive circuits I will probably add cooling fans and give it a try on higher voltages via a variac. But, before I blow it all up, I'm going to play with it some more and try controlling it via MIDI. First off I had to work out how to get the coil to play a tune. I already had a little PIC circuit that could play a dodgy version of "Captain Pugwash" on a piezo sounder. I tried Using an opto-isolator driven by the PIC's square wave output to replace the 555 timer output in Steve Ward's circuit and it worked. Something else I had a go at was an "ion windmill"... this is simply an "S"-shaped bit of bent wire that can spin around a vertical wire stuck to the top of the coil. When the coil is on, the electrons streaming from the tips of the wire drive it round!